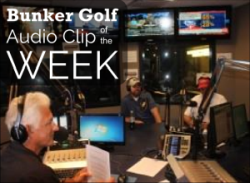 Around the world and right in your back yard, Bunker to Bunker, THE Golf Show, covers the great game of golf! Bunker to Bunker is hosted by Greg Ellis along with co-hosts Marty Monaghan and Jim Hill Saturday mornings from 7:00 to 9:00 A.M. on Arizona Sports 98.7 FM. Click each show to play online.